← Fight For truth. Stand For truth. Speak For truth. Pillars of the world must be toppled. Look to my leader, Samson. I placed my spirit upon him that he would have unearthly strength, yet he turned his affections to a prostitute that he spilled all his heart in exchange for the comfort she offered. 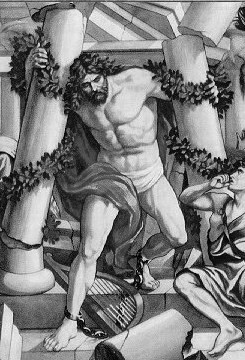 In his own darkest hour, made a fool and mocked and abused by the Philistines, I heard his cry and restored his strength that he pulled down those pillars of sin and debauchery that all those who served a deviant god were destroyed. I call to those of you who know of the power that I placed within you, who know that you must be my hands to topple the pillars of commerce, government, education, religion, media, arts, medicine. These are the realms that the enemy and filtered with distortions and extortions. These strong holds must be broken and I have given you the strength to call out the demons as my son showed you. I have given you the courage to scale these mountains as I gave Samson courage and strength at his last hour, as my son showed courage as he shed his blood. I ask that you give of the spirit that I have seeded within you. That you be my people who look to me in prayer and praise and know that the seed will flame into the power of my holy fire, that you march forward, never wavering, that you run to attain the prize, that you know you have the full armor of that which I have given, that you have the word of my power on your tongues. Know that my heavenly armies await you, they go before you as soon as you step on the road to victory, they will be your ministers, your ranks that your strength and your steps be multiplied. Doors will fly open that you claim those dark corridors that are the portals to flagrant lies and you will lash out with truth, scattering those demons whose power is only in what has been offered to them, who use cunning words that cut away at truth, and who hypnotize many nations. This entry was posted in prophecy and tagged Bible prophecy, Christ, Christianity, Delilah, Fruit of the Holy Spirit, God, God the Father, Holy Spirit, HolySpirit, Jesus, Philistine, Prophet, Religion and Spirituality, Samson, Truth. Bookmark the permalink.